When most think of the term “networking”, images of large events with people standing around in groups wearing name badges and one person awkwardly trying to infiltrate the group to become a part of the conversation comes to mind. Or people think of networking as giving any and everyone their business card, going on countless coffee meetings and maybe doing one follow-up afterwards, which ultimately leads to nothing. The fact of the matter is that there are many ways to network, but very few are able to do so in a way that’s meaningful and impactful. The key to effective networking is to focus on becoming a connector, and not just another networker. While you’re speaking with someone whom you would like to add value, ask them if there is anyone that they would like to meet to help grow their business (or whatever the situation calls for). Generally, people aren’t used to being asked this question or being asked how someone could add value to their lives. So just merely asking the question helps put you in high regard. After they give you an answer, think of the people in your network that you know meet that description. If you don’t have anyone in your network that they say they want to meet, think of people you do know that would be beneficial to them anyway. Sometimes people have a very narrow view of the types of people who can help them, but it’s the person that they never thought of that ends up being the best person for them. For instance, as a legal recruiter, I want to be introduced to as many attorneys as possible. If you would’ve asked me when I first got started if I wanted to be introduced to a disability insurance specialist, I would’ve said no. However, one person I met had the foresight to mention that I should really meet with this person and so I did, and he’s become one of my biggest referral sources and a mentor. Generally, when I want to connect Person A with one or more people, I send them a list of names of people I think they should know and a brief description why and then ask them if it’s okay if I reach out to these people on their behalf. If I want to connect Person A with Person B and I don’t have an ongoing relationship with Person B, I’ll ask Person B if they mind if I introduce them to Person A. Not everyone wants to be introduced to random people and I’ve made the mistake of just blindly introducing people I don’t have a referral relationship with and got my head chewed off. So don’t make that mistake and get permission from Person B first. However, if Person B is someone who I regularly send introductions to and we have a good referral relationship, I’ll go ahead and send the introduction between them and Person A without asking for Person B’s permission. Once you’ve gotten both parties’ permission to proceed with the introduction, you can craft the email. There are a few ways you can do this, but generally, you can include one sentence reminding them why you’re making the introduction. Then you can introduce Person A, and give a short blurb about them. And then introduce Person B, by giving a short blurb about them. And finally, just end the email by leaving it up to them to find a time to connect. As far as the short blurbs are concerned, you can ask both Person A and Person B for these ahead of time so you’re just copying and pasting what they want you to say. People can be particular about how they want you to describe what they do, so sometimes it’s just best to ask if they have a short blurb you can use to make the introduction. If they don’t, you can just craft one based off of what you know about them and perhaps their LinkedIn or website. Calendar some time in the future to follow-up with either or both parties to see if they were able to connect and if the meeting was beneficial. The reason you want to do this is not to be meddlesome, but to ensure that you’re making good connections and referring quality people. If you’ve been introducing Person B to three people and all three people say Person B either flaked on the meeting or they hired them and they sucked, you need to know that so you don’t introduce Person B to anymore of your network. Likewise, if the connections are beneficial, you need to know that as well. 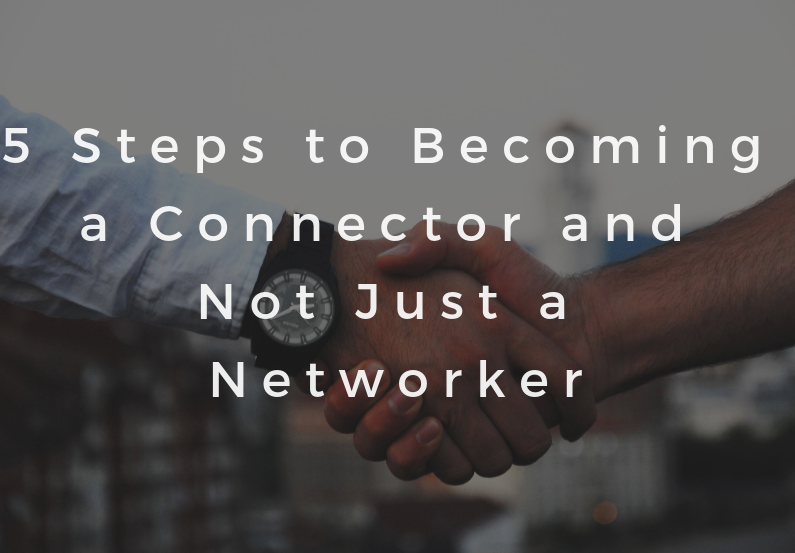 If you follow these steps, you’re well on your way to becoming a connector and not just a networker. Keep in mind that becoming a connector isn’t about amassing a network of tens of thousands of people. It’s about focusing on quality and not quantity. If you get the quality part right, the quantity will come.